Netanyahu Says Israel Is 'Nation-State Of The Jewish People And Them Alone' The remark made less than a month before Israeli legislative elections prompted many people — including Israel's president and the star of Wonder Woman — to defend Israel's Palestinian Arab minority. Israeli Prime Minister Benjamin Netanyahu said Arab citizens have equal rights under the law but that Israel is the nation-state of the Jewish people — and only them. Soon after, Israeli President Reuven Rivlin said Israel "has complete equality of rights for all its citizens." 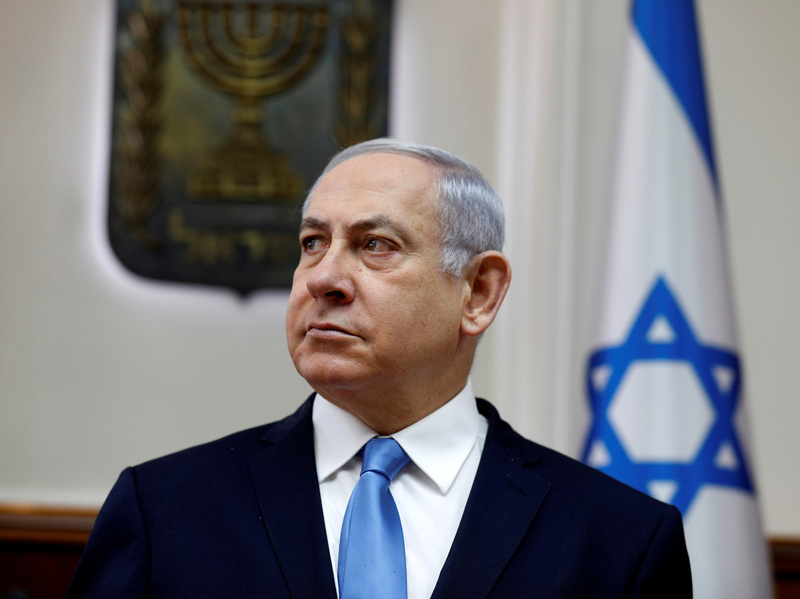 The prime minister's comment set off criticism, debates over Israel's true nature — and observations that with Israel's legislative elections now less than a month away, Netanyahu's provocative language might be calculated to help his Likud Party at the polls. Netanyahu and his party are warning that if they lose upcoming elections, the new government could include Arab political parties. The saga began when Israeli actress and TV host Rotem Sela posted an Instagram story about comments that Culture Minister and Likud member Miri Regev made during a news interview. Sela questioned why Regev's statements about what she called the dangers of Palestinian Arab citizens taking part in a governing coalition went unchallenged. "When the hell will someone in this government tell the public that Israel is a country of all its citizens," Sela wrote. Much of the dispute that followed played out on Instagram, where Netanyahu responded to Sela, "Dear Rotem, an important correction: Israel is not a state of all its citizens." Referring to a hotly contested law adopted last year that defines Israel as the nation-state of the Jewish people, the prime minister said Arab citizens have equal rights under the law, but that Israel is the nation-state of the Jewish people — and only them, Ynet News reported. Israeli movie star Gal Gadot, who plays Wonder Woman, weighed in, backing Sela and calling her an inspiration. "Love thy neighbor as yourself. This isn't an issue of right or left. Jew or Arab. Secular or religious," Gadot said on Instagram, according to The Associated Press. "It's an issue of dialogue." On Monday, Israeli President Reuven Rivlin said on Twitter that Israel "has complete equality of rights for all its citizens," adding, "There are no first-class citizens, and there are no second-class voters. We are all equal in the voting booth. We are all represented at the Knesset." Rivlin did not refer to Netanyahu directly, saying in a tweet, "Recently, when political thinking is turning all reason on its head, we hear entirely unacceptable remarks about the Arab citizens of Israel." For political observers in Israel, the story has echoes of 2015, when Netanyahu posted a last-minute video on the day of a national election, claiming (falsely, it turned out) that right-wing rule of Israel was in danger because large numbers of Arab voters were heading to the polls in buses provided by left-wing groups. The tactic was widely criticized — but it was also credited with helping to sway the election result. During this election season, Netanyahu's camp has circulated the phrase, "It is either Bibi or Tibi" — using the prime minister's nickname and referring to rival Ahmed Tibi, a Knesset member since 1999 and leader of Ta'al, also called the Arab Movement For Change party. But Netanyahu's actual rival for the prime minister's chair is the Blue and White Party's Benny Gantz. Earlier this month, the Anti-Defamation League issued a statement in which it "called on Israeli political leaders across the spectrum to stop delegitimizing Israeli Arab political parties and vilifying the Arab minority population of Israel." In that statement, Carole Nuriel, the director of ADL's Israel office, said recent incidents of politicians using anti-Arab rhetoric were "a deeply troubling trend that, if it continues, could undermine Israel's vibrant democracy." This is not the first public dispute between Netanyahu and Rivlin, two former allies in Likud. Rivlin was an early critic of the Jewish nation-state measure, saying shortly after his election in 2014 that it risked separating the concepts of Israel as being both democratic and Jewish. In 2015, Rivlin also criticized Netanyahu for his behavior toward then-U.S. President Barack Obama. The prime minister had clashed with Obama over the Iran nuclear deal and angered him by visiting Washington to deliver a controversial speech to a Republican-led Congress.